Yesterday's post about the PuppetMaster app prompted a couple of people to ask me if there is anything similar available for Chromebook use. While I can't think of anything that is free and exactly like PuppetMaster, here are some options for creating animated videos on Chromebooks. Animatron is a nice tool for creating animated videos and images. To create a video on Animatron you start by dragging and dropping characters on a background scene and then choosing how long each character will be displayed in a scene. You can also set the length of time for each character in a scene to be in motion. 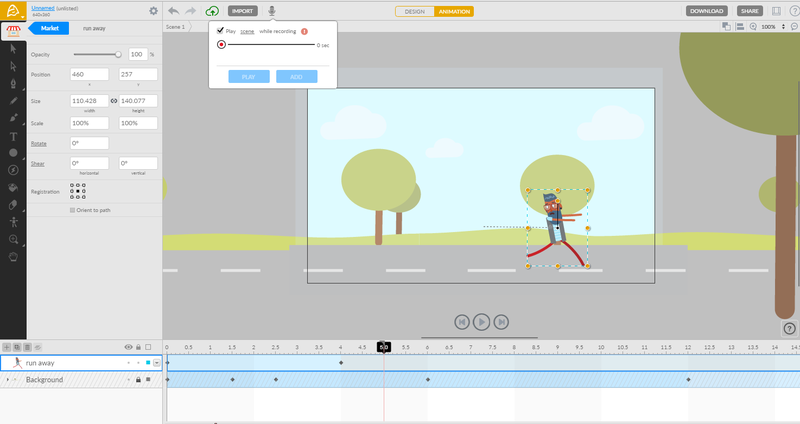 By using Animatron's timeline editor you can make objects appear and disappear from a scene. The best feature of Animatron is that you can record audio directly over the animation. The built-in recording tools lets you see the scene while you're recording so that you can precisely synchronize each scene with its audio track. PowToon is a popular platform for creating animated videos. In PowToon students create animated videos on a scene-by-scene basis through a series of slides. Students can choose background scenes, characters, and scene objects from a huge media gallery. After configuring the scenes of their stories, students can record voiceovers or play music in the background. Toontastic 3D is available to use on Chromebooks that support the use of Android apps. Check this list to see if your Chromebook supports the use of Android apps. On Toontastic 3D students can pick from a variety of story setting templates or they can create their own. Once they have established a background setting students then select cartoon characters to use in their stories. Students can choose from a wide array of customizable cartoon characters or they can create their own from scratch. Once characters are placed into the story scenes students can begin recording themselves talking while moving the characters around in each scene. Students can swap characters between scenes, change the appearance of characters between scenes, and move characters from one scene to the next. MySimpleshow is a free tool for creating Common Craft-style explanatory videos. MySimpleshow requires you to write a script for your video before you can start adding illustrations and sounds to it. In MySimpleshow you will find a wide variety of script templates that will help you plan your video. The script is written in chapters that become the outline for your video. After you have written your script MySimpleshow will take your chapters and give you suggested images and animations to use. The suggestions are based on the keywords in your script. You also have the option to upload your own visuals to use in your video. Adding narration to your video is the last step in the MySimpleshow editor. There is an automated text-to-speech narration that will read your script as narration for your video. Completed videos can be downloaded and or directly uploaded to YouTube from MySimpleshow. Scratch is designed for introducing students to programming. Creating animations is part of the programming that students can learn through using Scratch. ScratchJR, available for some Chromebooks, is the version of Scratch designed for students in K-2. Plenty of tutorials abound for getting started using Scratch. The best place for teachers to start is on the Scratch for Educators site. There you will find many tutorials, activity guides, and a curriculum guide. The ScratchEd community is the place to go for inspiration from other teachers who are using Scratch in their classrooms. For example, in ScratchEd you might find something like this Google Doc filled with ideas for using Scratch in elementary school mathematics lessons.